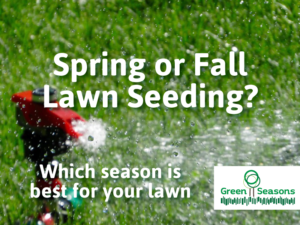 Should I seed my lawn in the Spring or Fall? That is a tough question! Here are some questions that you have to answer before you decide to seed in the spring or fall. How bad is the area that needs to be seeded? Is it a giant bare spot? Is it just a few little bare spots that are hardly noticeable? Can you live with it until late summer? Will you be able to maintain watering on a weekly basis during the summer? Are you away from home during the summer? Can you handle a larger that normal water bill for most of the summer? Are you OK if you have more crabgrass than usual? A Spring seeding means that you really have to really monitor that new grass during the summer. Seeding in the Spring only gives that new grass a few months to establish roots before the hot and stressful weather sets in. This could cause some of the new grass to stress out and die in the heat, leaving the need for more seeding in the fall and more money spent on the project. If the area is giant bare spot or significantly bare ground, then a Spring seeding is likely necessary. If it’s just a few little bare spots, then it might be better to wait until late summer for the seeding. If you seed in the Spring, then you will need to water on a weekly basis for nearly the entire summer, with the exception of rainy days. If you travel a lot and won’t be home to water, then a late summer seeding might be the better option. If you do maintain a faithful watering schedule for the new grass, then you will be facing a water bill that could be hundreds of dollars more each month. 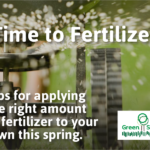 If you seed in the spring, then you will not be able to use the Crabgrass Preventer products on the areas that are seeding, due to the fact that they won’t let the new grass seed grow too. Crabgrass can be a severe nuisance with a Spring seeded lawn, especially when the summer heat sets in. The Crabgrass can growth very vigorously in the heat, leaving large dead spots after it dies at first frost. If you wait until later summer (September) you are looking at 3 months of root growth for the new grass before the cold weather sets in and everything stops growing for the Winter. This will give the new grass all Fall and then all the following Spring to develop strong roots before it will have to endure the summer heat. It will also take the pressure off your watering bill due to Fall rains that usually occur. There you have it! If you ever have any questions or decide you’d like to have a professional take care of it for you, don’t hesitate to call! 816-532-0173! What nutrients does my lawn need? 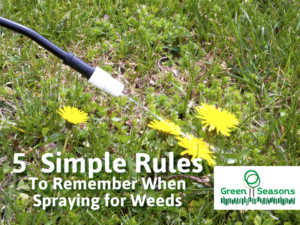 5 simple rules to remember when spraying for weeds. Don’t forget! A regular, healthy lawn program alleviates some thinning, and bare spots under trees may need lime to condition the soil pH! Thanks for helping educate us about this important topic! Many homeowners wonder why their grass isn’t growing, and reading this article can definitely help answer those “why” questions!